A digital partnership that delivers top rankings in organic local search results, with a visually stunning website to generate leads and conversions. Thames Valley Landscapes initially approached us when looking for a local digital marketing agency to push their search engine optimisation efforts to the next level. Although they were already ranking highly for searches within the town they are located, they wanted to raise their profile in neighbouring areas, particularly those with a high proportion of high net-worth residents. In addition to this, they also wanted to start a strategic shift towards commercial contract work, which guaranteed a regular monthly income to the business. We started with implementing a programme of local SEO to acquire new residential contracts. We reviewed their website and carried out technical improvements. Then added local mark up to help search engines understand better the areas they wished to cover. A programme of content creation was started, with optimised blogs and landing pages being added to the site on a regular basis. Alongside onsite activity, ongoing off-site optimisation was undertaken to ensure local listings remain up to date, consistent and optimised across the board. Link building opportunities were also actively sought from high authority sites, relevant to their area of business. Performance continues to be reviewed every month to ensure future activity remains on track and heading towards our clients goals. Our SEO campaign continues to play a significant role in driving highly targeted traffic to their website from new customers in their desired locations. 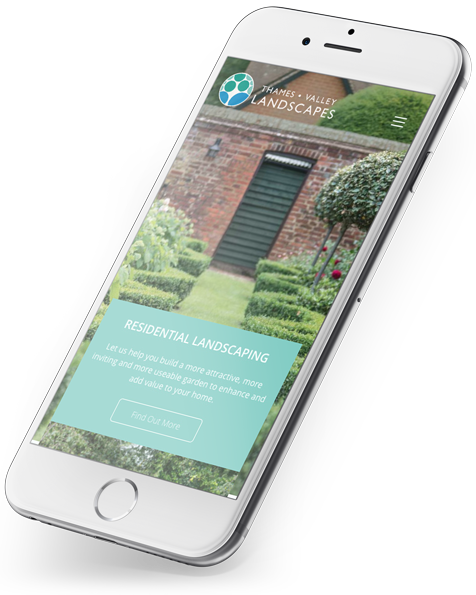 After seeing the results of our campaign, Thames Valley Landscapes asked us to work with them to create a new website that would showcase the range of their work, and quality of their workmanship. As well as to promote both the residential and commercial sides of their business. Equally important was to ensure that gains made in organic ranking were not lost when the site switched from old to new. Careful planning and attention to every detail saw a successful launch with minimal impact on rankings, with a website that now generates a 22.5% increase in leads. We were striving for a website that was far more professional aesthetically and easier to navigate for our different customer base. They listened to our brief and took on board exactly what we wanted. Further more, their expertise gave us assurance that their suggestions for improvements and alterations were quantified. Our partnership with Thames Valley Landscapes did not end there. In addition to delivering a new website and on-going SEO work, we continue to work closely with them to produce branded print marketing material to increase their order win ratios even further. Over the past 4 years working with Thames Valley Landscapes, we have seen their business grow steadily to the point where they are now one of the largest and well respected landscaping and garden maintenance companies in the area. Regularly winning high profile contracts with local clients that fit their target customer profiles. Improve your digital offering and increase the volume and quality of your enquiries. We are extremely happy with our new website and feel it really reflects where we stand in our market. Immedia are a team working to excellent standards and respond very quickly to any requests we have. All members of the team are professional, proactive and easy to deal with and we would happily recommended to other like minded modern businesses.